Happy Trendy Tuesday everyone! This week I’m showing you one of my favourite combinations for a casual fall outfit: jeans with a long sleeve shirt layered over a tshirt with a vest on top. Many of these pieces are repeat items that I wear quite frequently, but previous to this post I had never worn together. 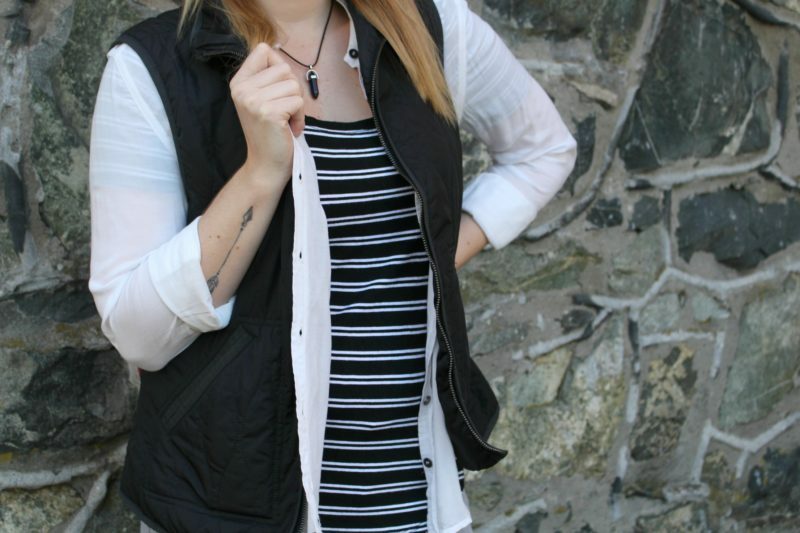 The vest and flats can be seen styled in one of my first fashion posts – I can’t beleive it’s almost been a year! – , and you can also see another way to wear a white button up with jeans here. As it gets cooler I like to wear lots of layers so I can adjust accordingly throughout the day. This particular casual outfit would be great for running errands, going for coffee, or visiting with friends, but you can dress it up or dress it down depending on which pieces your choose. You could dress it up with a dressier vest and some pumps, or make it more casual with some converse and swapping the button up for a sweater. You can use this basic outfit combination to create so many different looks. The pattern mixing of the stripes and leopard adds interest to the outfit while still remaining neutral. I kept the jewelry to a minimum with this necklace I made from a stone from Ebay and some cord from Walmart. You can recreate this casual fall outfit by mixing together the different top layers with your favourite casual pants. Keep it plain, mix some patterns, or play with some colour, it’s all up to you.